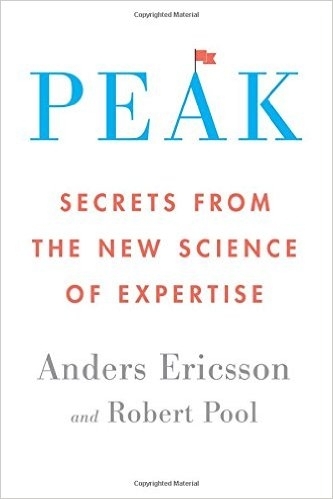 This is the best book on mastering a skill that I’ve found. Anders is the real deal, doing most of the research that other books on this topic are based on. If you only read one book on mastering your craft, read this one. Second, if you still believe there’s such a thing as talent, you also need to read this book. It’s been disproven in countless studies now, with Anders leading most of it, and the sooner you stop thinking talent exists the sooner you can become a master. Perfect pitch can be trained if you get the kids early enough. By exposing them to tones and challenging them to match them before age 4, they can develop perfect pitch for the rest of their life. Even adults can learn some of this, though there is some brain plasticity at that young age that makes it easier. The central message: The right sort of practice carried out over a sufficient period of time leads to improvement. Nothing else. There is no such thing as natural talent or prodigies. Anders spends most of the book explaining what “the right sort of practice” is, as well as why talent doesn’t exist. But it comes back to this central message, that anyone can improve, and that it takes time. The only shortcut is practicing the right way. If you don’t buy the “no talent” thing, please buy the book, he has a whole chapter on it. A common learning obstacle: If you reach a skill level that feels “satisfactory” to you, you stop improving, and even get worse with time. Just playing tennis for fun with your friends won’t get you much better, since you’re not pushing yourself. The more “automated” your performance has become, the less you’re learning. Naive practice in a nutshell: I just played it. I just swung the bat and tried to hit the ball. I just listened to the numbers and tried to remember them. I just read the math problems and tried to solve them. This is how most people “practice” but it’s ineffective. Purposeful practice has well-defined, specific goals. Without such a goal, there is no way to judge whether the practice session has been a success. Getting outside of your comfort zone, feeling uncomfortable. If you never push beyond your comfort zone you’ll never improve. Without feedback— either from yourself or from outside observers— you cannot figure out what you need to improve on or how close you are to achieving your goals. The best way to get past any barrier is to come at it from another angle, which is where coaches can help. Think about dropping weight or changing exercises to get through weight lifting plateaus. Keep changing things to keep learning. Go faster, farther, over new terrain, if you do the same run every day then you’re not improving. We only learn until we feel like we’ve hit a “good enough” point. As soon as we feel like we’re good enough (subconsciously or consciously) we stop improving, even with continued repetition. Your skill in anything is based on the number and quality of “mental representations” you have for the skill. For example, chess players improve most by studying and challenging themselves with expert matches. They build mental representations of others’ games, which help them improve much more than simply playing more games. The main purpose of deliberate practice is to develop effective mental representations, and, as we will discuss shortly, mental representations in turn play a key role in deliberate practice. … to write well, develop a mental representation ahead of time to guide your efforts, then monitor and evaluate your efforts and be ready to modify that representation as necessary. Deliberate practice is even better than purposeful practice. The field must be well developed, the best performers must be clearly far superior to people just entering the field. If there’s no competition to indicate skill, then it’s hard for there to be deliberate practice because the differences of the best are less clear. Deliberate practice requires a teacher who can provide practice activities designed to help a student improve his or her performance. Full attention and conscious action, no autopilot. This is the basic blueprint for getting better in any pursuit: get as close to deliberate practice as you can. If you’re in a field where deliberate practice is an option, you should take that option. If not, apply the principles of deliberate practice as much as possible. Come up with training techniques that allow you to do it, too. The 10,000 hour rule misses a lot. Performing is not deliberate practice, and doesn’t help you get much better. The # of hours you need to put in is relative to the other people you’re competing with, in a new field you can become a “master” in 20 hours. For chess it might be more like 40,000. Skill is more useful than knowledge, it’s what you’re able to do, not what you know, that sets you apart. School is, unfortunately, based around knowledge. This is why it’s usually useless. It is much easier to present knowledge to a large group of people than it is to set up conditions under which individuals can develop skills through practice. We should focus on how do we teach the relevant skill, instead of how do we present the relevant knowledge. For anyone who wants to improve at anything, here is a basic framework. Private instruction is ideal, since they can best point out what you specifically need to improve and work on. Know when you can’t gain anything else from them, though, and move on (see Mastery). If your mind is wandering or you’re relaxed and having fun, you probably aren’t improving. Whatever you’re doing, focus on it. Don’t engage in mindless repetition. What if you don’t have a teacher? Break their writing up into the pieces you want to improve. If you want to improve sentence structure, then write down the ideas of the sentences and save them for later. Once you’ve forgotten the exact wording, try to recreate the sentences on your own from the ideas, and then compare your creations with the originals to see what makes theirs better. Identify the pieces that are making yours less strong, then create exercises to improve those elements. So Franklin realized his vocabulary wasn’t as strong as it could be in the moment, so he did poetry to become more creative with his word choices. Did the same thing with order, taking pieces and putting them on note cards, then jumbling them up and trying to put them back in order and comparing. You need to find a way to push yourself out of your comfort zone. Use repetition to figure out where your weaknesses are and focus on getting better in those areas, trying different methods to improve until you find something that works. The best way to move past any plateau is to challenge your brain and body in a new way. Figure out the components of the skill that are holding you back, and find a way to push yourself more on those specific elements. Design a practice technique focused on improving that specific weakness. To keep working on something, you need to keep the reasons to continue high, and the reasons to quit low. To increase focus and decrease demotivation, limit practice sessions to 1 hour. If you want to practice more, take a break in between sessions. Create a group working on the same thing so you can all motivate each other to keep improving.